We are offering General Surgeon's Stool to our clients. - High Adjustment by pneumatic syringe. - Five Castors for smooth movement. - Pre Treated and Epoxy Powder Coated. - We offer pneumatic stool that gives maximum comfort and has high durability which is made using highly advanced technology and top quality raw material is used in manufacturing this pneumatic stool. - A pneumatic piston is provided to adjust the height as required with adjustable neck rest to make it more flexible to the both patients as well as doctors. Owing to vast domain expertise, we offer comfortable and quality assured range of Doctor Stool that is easy to use and comes with varied dimensions. They are attached with the movable castors thereby ensuring easy mobility. Offered range is attached with quality assured foam to ensure easy application. Moreover, we offer them in varied designs and patterns. Made of Mild Steel 16 Swg CRCA pipe duly powder coated in White Colour Revolving S.S.Top. 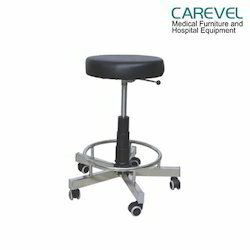 Revolving Doctor StoolDoctor/nurse stool.Height adjustable.Mounted on 5 swivel castors. In order to fulfill the ever-evolving demands of our esteemed clients, we are engaged in providing an optimum quality array of Patient Stool. - A bowl shape seat provides seating without strain and backrest moves with the body giving support all the time to the spine. - Height adjustment up & down by pneumatic piston. 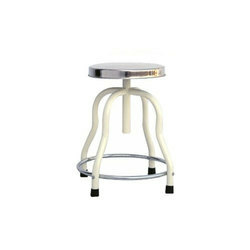 HF752S - Patient Stool Revolving (SS Top), Size: 460 - 660 Mm. Size: 460 - 660 mm. - Four leg base mounted on PVC stumps. - Height adjustable by screw mechanism from 460 - 660 mm. Made up of SS frame.